It was midsummer. I was about twenty years old. I had started to try my hand at writing but hadn’t got very far. I was rather surprised to receive a formal invitation from Barbara Cartland, author of 325 books, with recorded overall sales of between 500 and 600 million copies. She had invited me to her Hertfordshire house in time for dinner one Friday evening. When one is invited to a country house to dinner on a Friday, one automatically assumes that one is expected for the whole weekend, so I packed accordingly. I had never met Barbara Cartland and had no idea why she wanted me to go to her house. However, she knew members of my mother’s family, which may, for some reason, have prompted her to seek me out. There was also a possibility that she might have invited me by accident when intending to ask someone else. I drove to her house from London. I extravagantly hired a black cab to drive in front of me while I followed – my map-reading skills are very poor. The taxi driver lost the way three times. The heat was overpowering. By the time we reached the house, both the taxi driver and I were in foul tempers. I got out of the car and rang the bell. 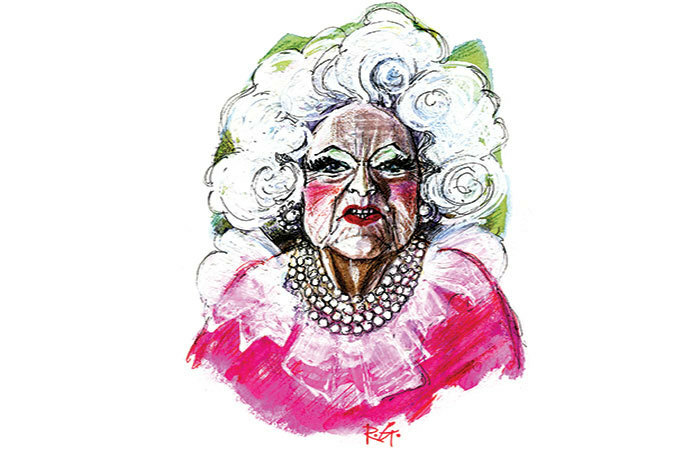 I was astounded by the fact that the door was opened by Barbara Cartland herself, who was dressed from head to toe in the brightly coloured fluff which comprised her trademark. The expression on her face, framed by the shock of fairground-candy-floss-like hair, was unwelcoming. My initial reaction was of anger towards her for having dragged me all the way from London for no apparent reason. ‘The name’s Eleanor Berry,’ I said abruptly. ‘You asked me to come here. Here’s the invitation card.’ I sounded like an angry temp reporting to a personnel manager. She didn’t say anything for a while and looked irritated. I had the impression that she was a silly, selfish clown who was messing me about. ‘I repeat, you are only invited to dinner. I can’t imagine what you intend to do with those suitcases,’ she said. ‘There’s not much I can do, is there? I’ll have to bring them into your house so that I can change for dinner.’ She continued to stand in the doorway, while I waited outside. A funny thought suddenly came into my head. Robert Maxwell had once said that if someone treated me like that, I should hit them on the head with a shoe. ‘What are you laughing at?’ asked the Sugar Plum Fairy. ‘Did you say your name was Eleanor Berry?’ she asked. She ushered me into the house and asked someone to direct me to a room where I could change. The room was almost as uninviting as the ill-mannered writer I had just met. The blinds were closed, and the double bed and chairs on either side of it were covered with dustsheets. I stripped off and changed. The invitation card said that dinner was at 8.30. It was then only 7.45. I noticed a wall-to-wall bookshelf which contained only Barbara Cartland’s books. I wasn’t particularly familiar with them at the time. As I had managed to get into the house and would be eating my (albeit thoughtless) hostess’s dinner, I decided to be polite and on my best behaviour. I sat next to Barbara Cartland at dinner. ‘I’m an admirer of your books, Miss Cartland,’ I said. ‘Well, from what I can remember – I haven’t read them recently – I was struck by your vision of love in its purest form, rather than the tarnished and tacky infatuation which in this perilous modern world is mistaken for love.’ I think she was put off by my academic language, which I used without thinking. She fixed me with a curious, vacant stare. It has always been my theory that if you are a guest at someone’s table, you have a duty to tell that person what he/she wants to hear, whether it is true or not. By the time I left, Barbara Cartland had become more pleasant and friendly towards me, possibly because I lied to her about my liking her books. I admired her because of the colossal number of books she had written, even if they didn’t appeal to me. I learnt afterwards that she had done a lot of charity work, including campaigning for gypsies’ rights. I also learnt about her background. She was the daughter of a Birmingham businessman who died penniless. She had nothing and was self-made. She started off by selling articles to gossip columns, before turning to romantic fiction. The woman had guts all right. Of that there is no doubt. Where manners are concerned, that is another matter altogether.